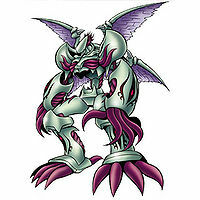 A cursed Digimon artificially created based on the data of various Digimon. Its nature is to evolve by absorbing its opponent's data, but it is unclear if it possesses any sense of self. Because these details are unknown, it is currently being investigated, but it is thought that Arkadimon's existence is the greatest threat to the Digital World, and must never be. 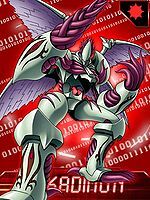 Its Special Moves are disassembling the opponent's data into a particle state and absorbing it (Dot Matrix), and the most wicked blow that completely erases them from the Digital World, forcibly expelling their data (Exile Spear). A cursed Digimon artificially created based on the data of various Digimon. Its nature is to evolve by absorbing its opponent's data, but it is unclear if it possesses any sense of self. Because these details are unknown, it is currently being investigated, but it is thought that Arkadimon's existence is the greatest threat to the Digital World, and must never be. 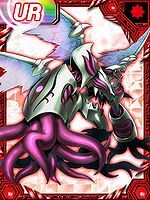 An Ultimate that absorbs dark energy. It is said to be virtually invincible, and completely disassembles data regardless of who the opponent is. Its Special Move is "Dot Matrix". | Arkadi comes from Arkadia 「アルカディア Arukadia」 (Αρκαδία), a utopian society in Greek mythology. | Arcadia is an alternative spelling of Arkadia. Arukadhi is a misromanization of アルカディ. 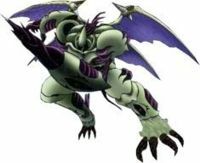 Anime/Manga Digimon Adventure V-Tamer 01: "Earthquake! Demon Castle!!" 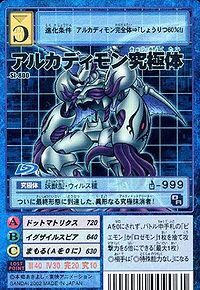 Dot Matrix  ドットマトリックス Dotto Matorikkusu An invisible attack that uses a lot of energy, but takes a chunk of the opponent's data, restoring Arkadimon while doing damage. 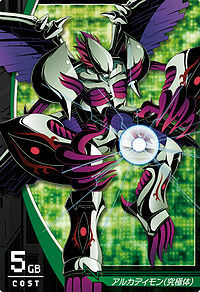 Exile Spear  イグザイルスピア Iguzairu Supia Twists the tentacles of one hand into a spear and stabs the opponent. Arkadimon evolves to Ultimate after absorbing Demon. 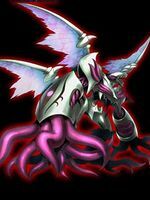 Arkadimon is able to hold its own against Omegamon and Rosemon, and later, Omegamon, Regulumon, and Dominimon. 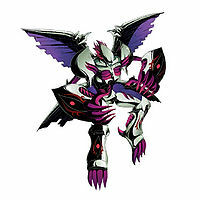 It was able to kill Rosemon and seriously injure Omegamon, but met its match when it fought AeroVeedramon. 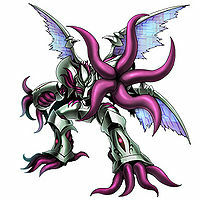 Neo then pulled out the Digimental, forcing Arkadimon into its Super Ultimate form. When defeated, Arkadimon reverts to its Ultimate form, where it is forcibly consumed by Daemon. Arkadimon Ultimate appers in Jupiter Zone. 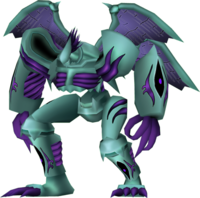 It is used by Lilithmon against the united forces of Xros Heart and Blue Flare, but Ulforce V-dramon defeats it before it can do any serious damage. 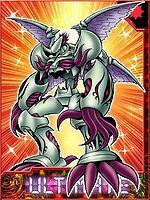 Arkadimon is available as a Digimon Card. Arkadimon is available as a Digimon Medal. This grotesque, ultimate deleter has attained its final form at last! 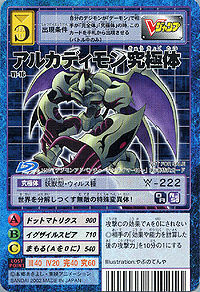 Preying even on Demon, this ultimate ghostly beast acquired the power of despair! The invincible mutant who will disintegrate the world! 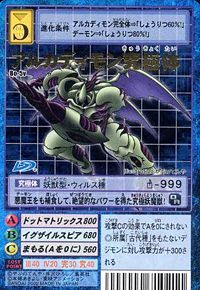 It absorbed dark data and accomplished Ultimate level evolution, attaining this form. It possesses a possible, further Ultimate evolution when in the hands of a Tamer, as well as a further mutation formed when left alone by a Tamer. 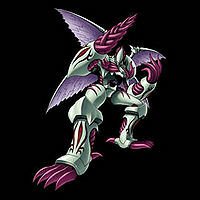 ↑ Digimon Adventure V-Tamer 01: "Earthquake! Demon Castle!!" 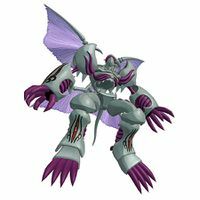 ↑ Digimon Adventure V-Tamer 01: "The Super Ultimate Is"